What if you could buy a home in one of the hottest neighborhoods of Oakland for only a dollar? That Bay Area real estate dream is a reality on Brook Street. 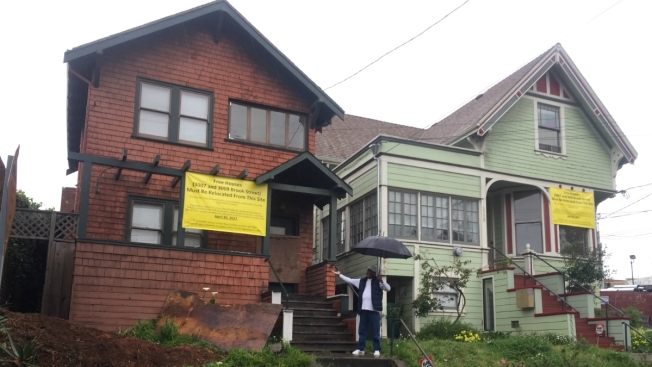 Two historic homes in Oakland are for sale for a dollar each. The catch is they need to be moved somewhere else, which will cost hundreds of thousands of dollars. The houses – one a handsome brown shingle, single-family home built in 1900, the other a simple but stately Victorian divided into three units – are on a property where developer Lowe Enterprises plans to build a 127-unit apartment building. The plans call for the facades of the warehouses on Broadway to be incorporated into the new structures. But 3007 and 3009 Brook Place will have to be moved. Lowe Enterprises did not return calls requesting comment. 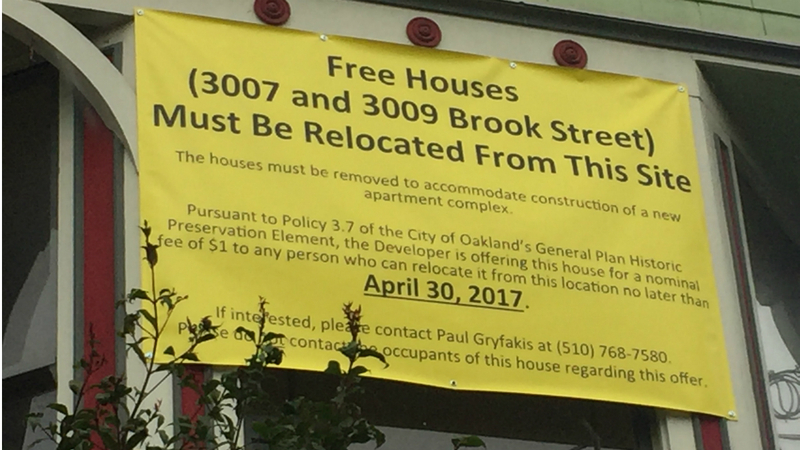 The remarkable real estate deal for the right buyer with land and house moving connections is made possible by Oakland's historic preservation rules, which require developers to make older buildings available for free or next to nothing to buyers who can move them. "They're not throwaways by any stretch of the imagination," city planner Pete Vollmann said. 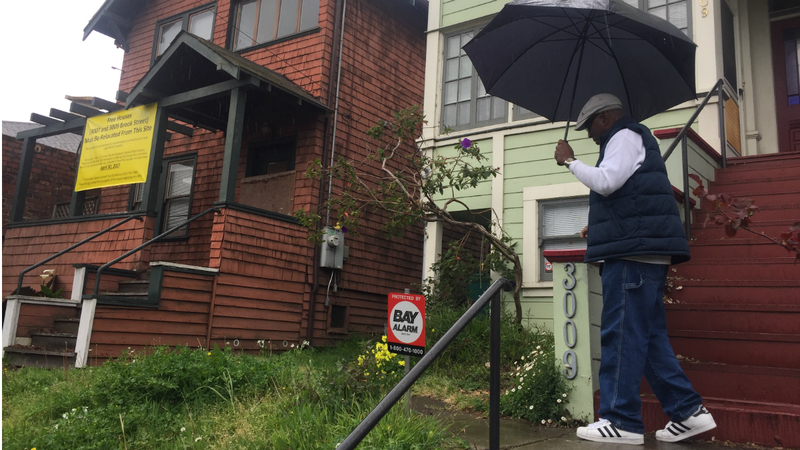 The homes, a block from Broadway between Pill Hill and the northern shore of Lake Merritt, are currently vacant. Both homes were designated category C in the Oakland Cultural Heritage Survey in 1997. Under the survey’s rating system, category A is the highest, and E and F are of "no particular interest." Category C buildings are “superior or visually important examples,” or built before 1906, therefore they warrant limited recognition and protection. That means the developer is required to post notice for 90 days before they are allowed to demolish the homes, Vollmann explained. Signs on the houses say they need to be moved by April 30. That date feels very soon to William Randolph III, a land surveyor by trade who knows of quite a few empty lots. But before he can do the dollar deal, he needs to get his small investment group on board. "I'm getting ready to call my team because I think we can do this," he said, looking up at the buildings from under an umbrella on Monday. Randolph's plan would be to buy both houses for $2 and move them both. Because once you’ve moved one house, why not move another? A house for a dollar is a steal anywhere. But moving a building is not cheap. Depending on the size of the house, its construction and the distance, house moving services start in the six-figure range. It sounds like a major project because it is. "There's a long tradition of moving frame houses around in cities," said Naomi Schiff, a board member for the Oakland Heritage Alliance. "In recent years, it's rare because it's expensive and hard to find a lot to move to, especially a place in a location where you can access it on a truck." Then there are freeway overpasses, overhead wires, sidewalk trees and signs and other objects that project into the street. "We've had a number of people who have looked at it but not anyone who has filed a development application to move it. Hopefully someone will apply because [the developer] is going to want to break ground pretty soon," Vollmann said. The development that will take the place of the two century-old homes has been approved by the city's Planning Commission and is now before the Building Commission. Vollmann said Lowe Enterprises is expected to keep the signs on the buildings posted, and listings for both houses on Loopnet, until that process is over. According to the Loopnet listings, the smaller home at 3007 has three bedrooms and a bath crammed into just more than 900 square feet. According public records listed on Redfin, the home last sold in November for $675,000. Before that, it was sold in 1984 for only $5,500. The Victorian three-unit house at 3009 sold for $925,000 in November, according to public records listed on Redfin. "This could present a great opportunity," Schiff said. "But that's entirely dependent on our overheated land market." Breaking even on the deal depends on finding – or already owning – an empty lot nearby. "These houses are kind of charming and intact. The neighbors say they're nice inside. It would be great to see them reused," she said. "I hope the developer will facilitate and allow enough time. It’s a short amount of time to line up a lot of details."